In the “Gezellige Poëzie” column, Laura Wetherington reports on poetry communities in Europe: festivals, independent bookshops and reading series, and innovations on and off the page. Read about the column title here. Arkbooks is located on a quiet side street north of the city center, along a block populated by literature: The Nordic-languages bookstore collective Møllegades Boghandel is just a few doors down, and the LiteraturHaus is directly across the street from Møllegades. This is no coincidence. 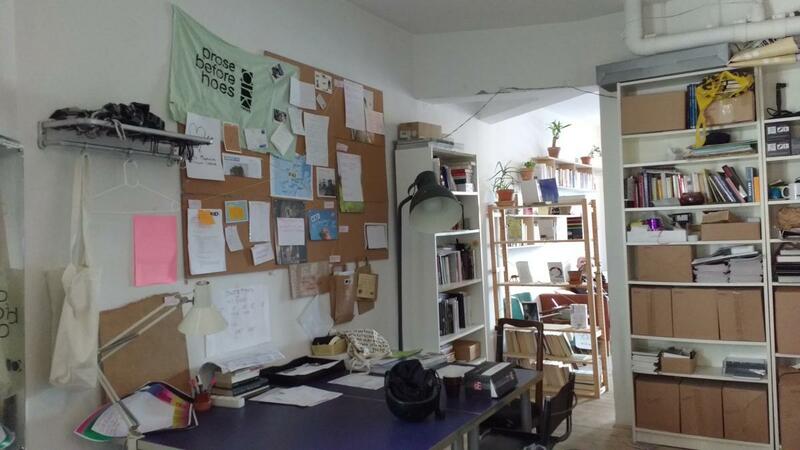 The two bookstores are outgrowths of LiteraturHaus, which rents the space to arkbooks and which started Møllegades as a for-profit shop and extension of their venue. 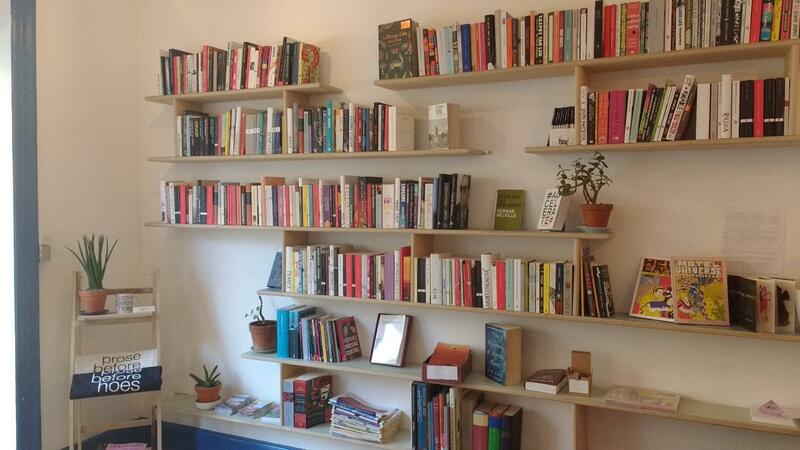 Enter the small front room of arkbooks and you’ll see free-floating shelves lining either wall. 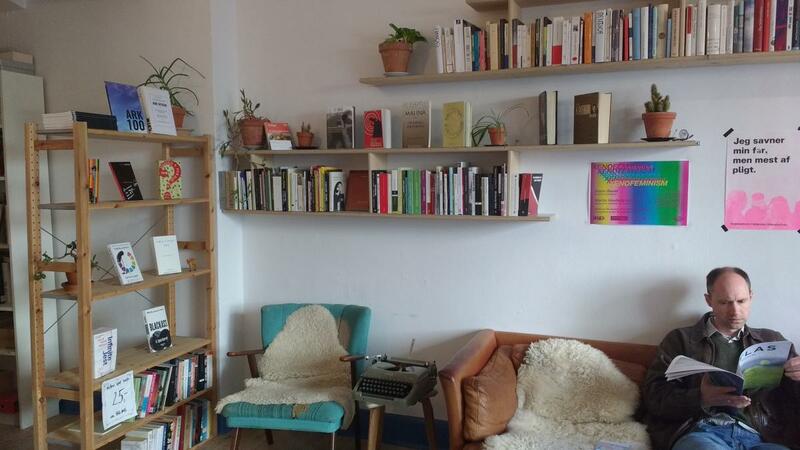 Along the left wall, prose, and to the right, a poetry & theory section, other foreign language section, and some furniture: an old couch and an armchair, both covered with sheepskins, and an army-green manual typewriter sitting on a small stool. 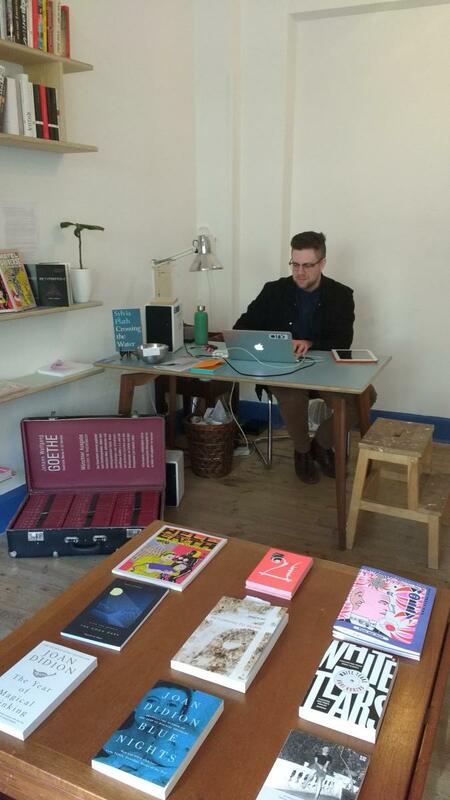 A standing shelf creates a screen between the retail space and the back room, with most of that shelf used for front-facing books, a stack of Ark 100—a print version of the usually-electronic journal—and used books donated by the community and sold at a discount. The bookstore offers mostly new copies of books in English, though they also stock German, and French, and Spanish volumes. I was particularly impressed by the poetry section, which had a robust selection of UK and US presses, including Ugly Duckling Presse, some Nightboat Books, City Lights Books, and University of California Press books. 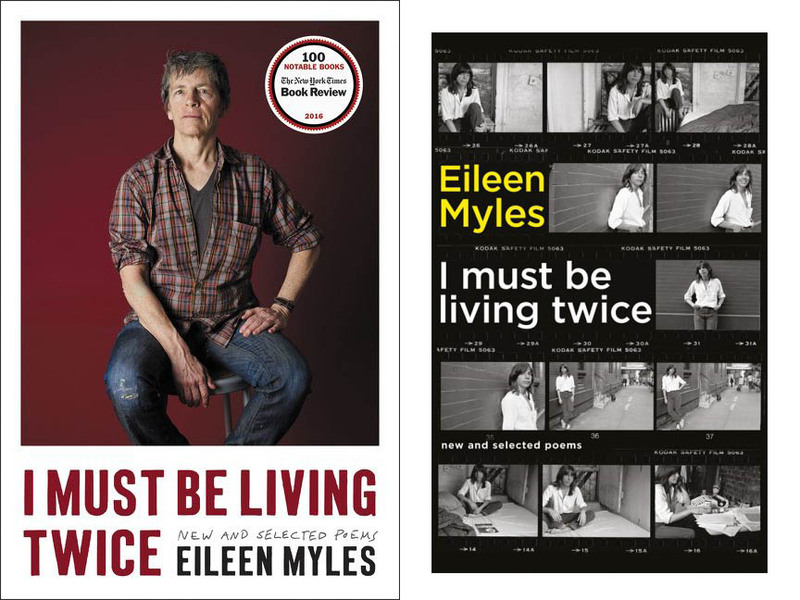 One of the small pleasures of book browsing in Europe is seeing the different covers for the UK print editions, like Eileen Myles’s I Must Be Living Twice. The UK cover almost made me buy the book twice. Arkbooks’s website explains that the initial startup wasn’t easy. Because the founders envisioned non-profit, volunteer-run organization that functioned as a retail store, it fell somewhere between most business and community organizational grants, making it difficult to find funding. So the founders turned to online, grassroots fundraising, an unusual approach at that time in Denmark. Their campaign was a success. You can see the Indiegogo campaign video below. Their organizational structure is particular to Denmark. This type of non-profit organization is called a "forening," which translates to something like “association” or “union.” Macon made clear, the Danish taxes are quite high because the social safety net is very strong. One benefit of a strong welfare infrastructure is that people who receive unemployment or study grants can volunteer at a place like arkbooks without giving up their assistance. The bookstore is run by a board and staffed by around 20 volunteers who are asked to work three shifts per month. Volunteers also plan events, write for the online literary journal Ark Review, and produce a podcast series. Most decisions are made through a consensus-like process in their monthly meetings. Macon says that many of the volunteers “have a writerly aspiration. They might be freshly graduated or in the middle of a masters. A few of them over the years have been scientists looking to feed other parts of their soul.” He added that expats often volunteer there; work at the bookstore gives new residents a built-in community. The bookstore’s an opening point in many ways. Because of the forening designation, arkbooks folds its profit back into the business. For example, surplus revenue has gone toward a print-edition celebrating publication of the 100th essay in Ark Review, and toward recording equipment for their podcasts. The podcasts range from book club discussions to event recordings. The store hosts on average two events per month as well as a yearly literary festival, called Lyse Nætter (Bright Nights) in collaboration with the LiteraturHaus and Møllegades Boghandel. They close off the street and set up a stage outside. This year the festival will run on the 23rd of June, 4th of August, and 1st of September. 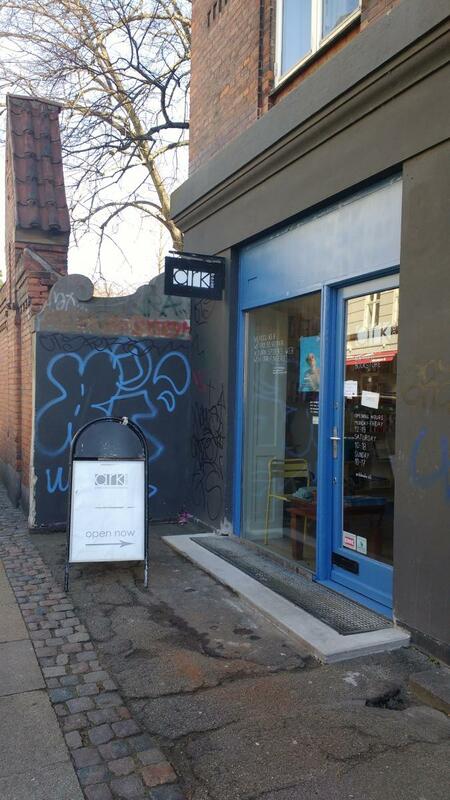 If you plan a trip to Copenhagen, don’t miss this bookshop, and if you can swing it, pack a choice book or two from your home country to donate. That'll ensure you've got room in your suitcase for the gems you'll find there. Laura Wetherington's first book, A Map Predetermined and Chance (Fence Books), was selected by C.S. Giscombe for the National Poetry Series. Bateau Press published a chapbook, Grief Is the Only Thing that Flies, chosen by Arielle Greenberg for the 2017 Keel Hybrid Competition. Her essays and book reviews appear in The Volta, Hyperallergic, Full Stop, Jacket2, and Kenyon Review. Laura teaches in Sierra Nevada College's low-residency MFA program.